Search, compare and book for Campervan Hire in Darwin. We Guarantee the Best Rental Prices in the Northern Territory - if you find cheaper, let us know! Campervan & 4WD Rental Darwin from $29 Per Day! Looking to Hire a Campervan in Darwin? On the backpacking trail, Darwin is often the last port-of-call for travellers in Australia. Not only is it the perfect gateway to Indonesia, it is also abundant with things to do. Over the dry season months (April to October), Darwin truly comes to life with parties and incredible waterfalls all on the fringe of Australia's northern border. The Northern Territory offers an experience like no other. It is the heartland of the Australian identity and while most Australians will never venture into the vast Red Centre, it's appeal has permeated the national consciousness as a place of wonder, peril, mystery and infinite beauty. Compare Campervan Hire offers fantastic value for your next campervan rental. Why not grab a camper or 4wd for your next Australian holiday? With over 100 great locations around Australia, Compare Campervan Hire is your number One choice for rentals! There is so much to of Australia to see and so many ways to see it. Today, even the most remote sections of this vast continent are accessible, particularly to campervans. For some, exploring Australia will mean touring the main highways and staying in motels. Others will tow their accommodation with them in motorhome hire vehicles. Others will opt for a campervan rental with sleeping and cooking facilities, and yet other group will choose to be the true adventurers, will load a tent on top of the 4x4 hire and go bush. In all cases, some careful planning will enhance the journey immeasurably. Since driving conditions in the outback vary greatly, you should always consider the right campervan hire Darwin for your travel. Campervan rental are the best when it comes to exploring Darwin. Check out our best pricing and book your travel with us. We provide the best campervan hire pricing in Darwin for budget backpackers in Australia. One of Australia's most iconic tourist destinations - Kakadu National Park. 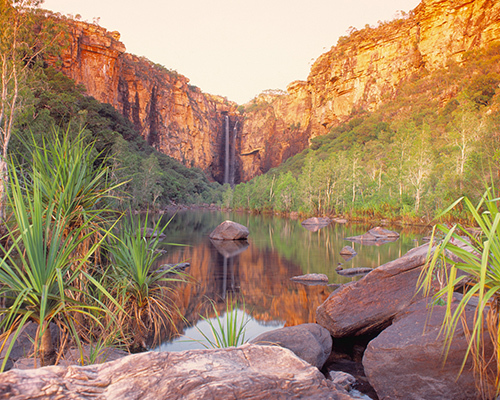 Highlights of Kakadu include Jim Jim Falls, crocodile spotting and ancient Aboriginal Rock Art. Only 2.5 Hours from Darwin, Kakadu National Park is a must-see destination if you've got a campervan or 4WD vehicle. Hire a Campervan in Darwin from $29 Per Day and explore Australia's incredible Top End!